I bought the Honda at top left.If I had it now I would be able to fix all the things that were wrong when I picked it up but back then I thought that if it looked cool that was enough.I sold it to a bloke in Bendigo and not long after that I heard that the frame had broken in half.That was 25 years ago.I'm building a GS1000 bobber but I can't post any photos because I'm not very good on a computer.I really enjoy the site. email or post some pics to me and I'll put them up for you. The sidecar in the back ground ... was that the one in the first Mad Max movie ? quote - "Cyclotron - The trike was originally constructed by Lance Seadon of Cycle Gear in Collingwood. The scrolling on the body was done in 24ct gold leaf by John Leach - Lance and John were both members of the Barbarians Motorcycle Club at the time. Features of the trike included a tube running from the dome to the rider, so that you could enjoy a smoke... "
"And the good news is... the trike still lives! The trike is still in Australia, and the pictures below were taken by Scott Page at the Street Machine Mad Max / Mad Max 2 screening in Blacktown in late 2001." It doesn't matter if you don't know - It does matter if you don't try. I'm a bit of a Mad Max fan too. 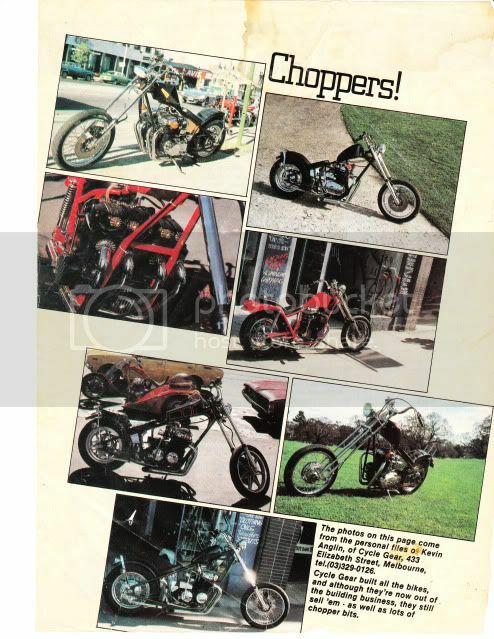 i was looking over those photos again, and i noticed, the original bike had girder forks, and the newer pics show it with springer forks and an added headlight ( maybe for legal road rego ). But an awesome machine none the less. I spoke to a guy some years ago who was one of the first to ride the bike... and reckoned it was awful. Don't know if the changed the geometry later.